I love Greek food especially when they are easy Mediterranean diet recipes! This favorite ranked #1 for top healthiest diets by region for many reasons. This diet healthy Mediterranean way is also a heart-healthy eating plan. Research has proven that this diet can reduce your chances for heart disease. A large scale study of over 1.5 million healthy adults showed reduced risks of not only heart disease but also reduced chances of developing cancer, Parkinson’s and Alzheimer’s diseases. A more recent study posted in the BMJ showed that healthy people who ate this way had a lower risk type 2 diabetes as well. A diet rich in fresh fruits and vegetables, nuts and whole grain breads and pasta as well as seeds and beans delivers a multitude of antioxidants, vitamins and minerals. This way of eating or “lifestyle” has created a culture of people with almost no incident of chronic disease! Introducing easy Mediterranean diet recipes into your family should become a priority. Recipes from the Mediterranean diet also include lots of monounsaturated fats that you would find in foods like fresh fish, olive oil and avocados. These foods are excellent at fighting disease at the cellular level and are anti-inflammatory in nature. Another important aspect in a healthy diet is exercise. Mediterranean living is also focused on daily physical activity. I talk often about how our diet and exercise should not be about the moment but instead it should be about a “lifestyle” and one that we can live by. There are many elements of this regional diet favorite that we can implement into the day-to-day such as daily exercise. Other aspects of easy Mediterranean diet recipes that we could practice include lots of plant based whole food instead of processed foods, more poultry and fish as opposed to red meat proteins and very limited saturated fats. Be Nutty for Nuts – keep almonds, walnuts and pistachios handy but watch portions! Test a variety of herbs and spices. You can spice the simplest of recipes up this way. Have a glass of red wine with dinner. Here are a few easy Mediterranean diet recipes for you to try at home. Remember these are easy Mediterranean diet recipes and yummy! Begin by combining garlic powder, oregano, ¼ tsp salt, and ½ tsp pepper. Heat skillet and coat with cooking spray, Add chicken and seasoning mixture. Sauté until chicken is cooked. Drizzle with 3 teaspoons of lemon juice, stir and remove from pan. Combine remaining, salt, pepper and lemon juice along with yogurt, tahini and garlic in a bowl and stir well. Toss lettuce, cucumbers and tomatoes. 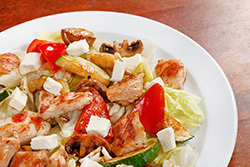 Divide salad mixture between 4 plates and top each with ½ cup of chicken mixture and a tablespoon of feta cheese. Drizzle 3 tablespoons of yogurt mixture on top of each. Here’s another one to try for easy Mediterranean diet recipes. Add 1 cup of fun to your easy Mediterranean diet recipes by inviting a couple of friends to enjoy! It serves 4. Bring water to a boil. Add pasta and cook for 8 minutes. 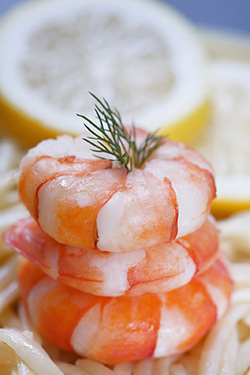 Add shrimp to pot with pasta and cook 3 minutes or until shrimp are done. Drain water and place pasta and shrimp on a large bowl. Stir in next 5 ingredients. Divide spinach into 4 plates and top each with 1 ½ cups of pasta mixture. Let me know how you liked the easy Mediterranean recipes! I would love to hear from you.